PENSACOLA, Fla. (AP) — Chappie James’ childhood home in downtown Pensacola is now history. But James, an American hero, might not be the last young person to walk the halls of the small home and make history. 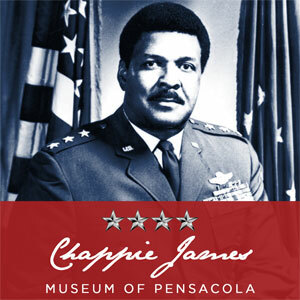 The Gen. Daniel “Chappie” James Museum & Flight Academy opened June 7. The historic home — where his mother also ran a school — is located at 1608 Dr. Martin Luther King Jr. Drive. James was a legendary Air Force combat pilot and the first African-American four-general in the U.S. military, earning his fourth star Sept. 1, 1975, when he assumed command of NORAD in Colorado. He died Feb. 25, 1978, at the age of 58. He is buried at Arlington National Cemetery. Better actually. Because it’s not just a symbol of past greatness, but a working lab for future achievement. The 900-square-foot home has been renovated and serves as a museum, but an additional structure has been added — a 1,500-square-foot building that will serve as headquarters and classrooms for the Gen. Daniel “Chappie” James Flight Academy. For 22 years, the flight academy has run free camps for largely underprivileged children to learn about the science and mechanics of flight. This year’s flight academy summer camp runs June 11-16. But with a permanent facility, the academy will now offer a year-round aeronautical program for boys and girls ages 13 to 18. The city of Pensacola and the Community Redevelopment Agency’s $1.1 million renovation/construction project broke ground in January 2017. The residence, which is listed on the National Register of Historic Places, was constructed in 1909 by Chappie James’ father, Daniel James Sr.
Jones said items are still being added to the museum, and other additions will be made throughout the year. James’ story is certainly inspirational. Early in his life, he would see pilots flying over downtown Pensacola and tell friends he was going to do that someday. Most laughed, knowing the pilots flying overhead weren’t black like they were. He was educated by his mother until high school, when he attended and graduated from Booker T. Washington High School. He then attended Tuskegee Institute, where he earned a bachelor’s degree and completed civilian pilot training under a government-sponsored program. He entered the Army Air Corps Aviation Cadet Program and was commissioned as a second lieutenant in July 1943 and trained as a fighter pilot. James flew 180 combat missions during the Korean and Vietnam wars, receiving numerous honors. He was a hard-core patriot and became known for his speeches on American exceptionalism, even at a time when many African-Americans were still fighting for civil rights.